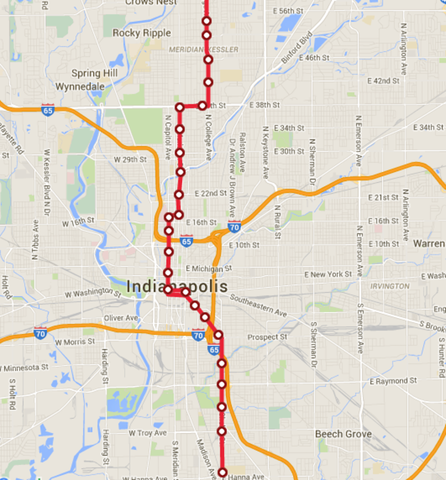 INDIANAPOLIS -- A big step forward for the IndyGo Red Line Bus Rapid Transit project. The Federal Transportation Administration recommended Monday that $75 million be released for construction. That means 80 percent of the first stage of the Red Line will be funded, provided that President Obama signs the budget bill covering it. Construction will begin in spring 2017 and will take about 18 months to complete. The 13-mile section will go from Broad Ripple to UIndy on the south side. When complete, the Red Line will stretch for 35-miles and through three-counties from Westfield through Carmel, into downtown Indy, and to Greenwood. The Red Line will be the nation's first battery-powered all electric BRT system. Johnson and Hamilton Counties still need to pass referenda to pay for their portions of the project.